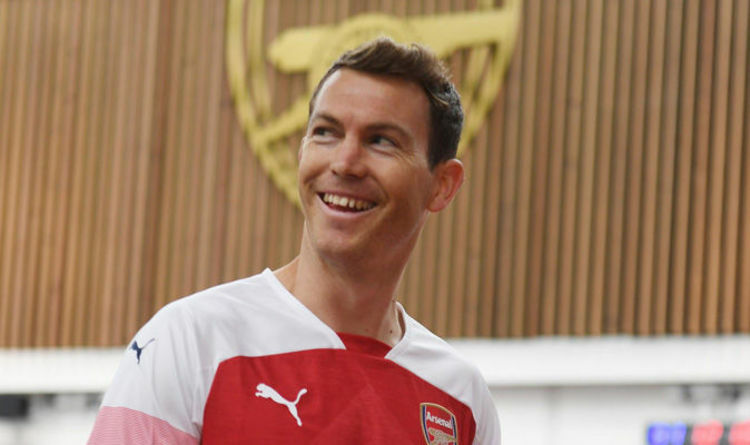 Arsenal have confirmed Stephan Lichtsteiner as the first completed transfer of the Unai Emery reign. The 34-year-old Juventus defender has arrived on a free transfer after seven years with the Serie A giants, and will offer another option at right-back. He will provide competition for Hector Bellerin and the experienced star comes with top-level European pedigree. The Gunners unveiled Lichtsteiner on social media with a full photoshoot of the newest member of the squad in the new home kit for 2018/19. The Swiss international ace – who will now head to the 2018 World Cup – also bumped into an Arsenal legend on his first tour of the London Colney training base. Take a look through the gallery to reveal the first snaps of Stephan Lichtsteiner in an Arsenal shirt.